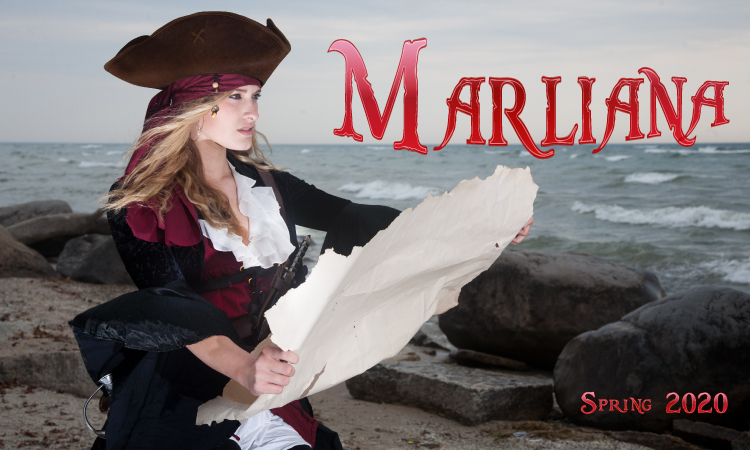 All actors who wish to participate in Company or Broadway, must audition to receive a placement. 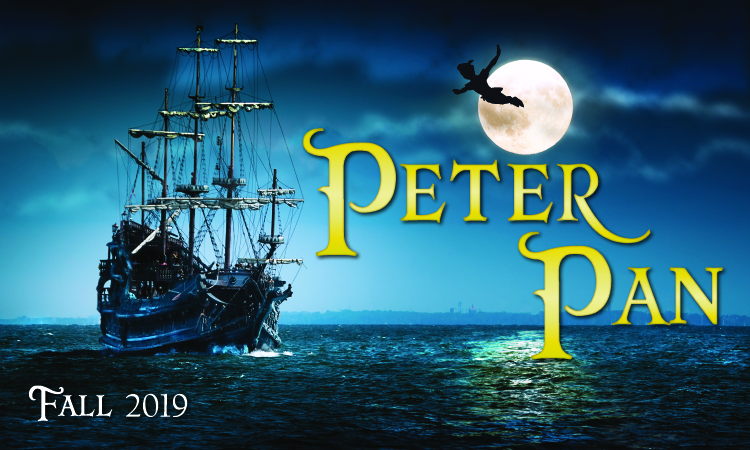 *Everyone who auditions will be invited into an amazing adventure! One goal of the auditions is to provide practice so our players are comfortable with the process and know how to let their abilities shine. To help ensure this, the directors in the room are warm and encouraging. A performer may be considering only one show, but may discover a special second invitation! This experience empowers the performers, allowing them to best select the show or shows in which they want to participate. *Please note that students currently enrolled in a Company and/or Broadway class do not need to register to audition because their audition will take place during one of their regularly scheduled technique classes. Students still need to take time at home to select and practice an audition monologue and song. 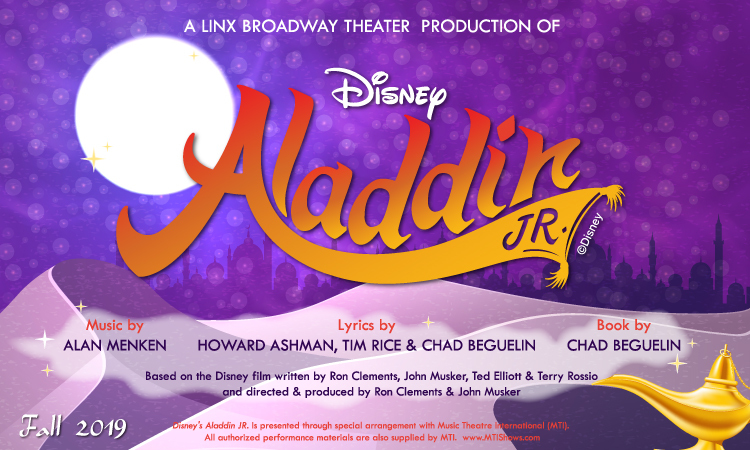 November and May auditions are held at LINX on Linden Street (141 Linden Street Wellesley, MA). Please check in at the front desk. July and August auditions are held at Dana Hall (45 Dana Rd Wellesley, MA). Please check in at the LINX Camps office in the Shipley Center. An audition is 15 minutes long. Parents are encouraged to wait for performers. Performer enters with six other players and all are together during the time. Each performer has about 2 minutes of the directors’ time to perform their song and monologue. Which programs/levels require an audition this round? Auditions are required for any new or existing members wishing to participate in Broadway and Company. Your performer will need to select a monologue and song to perform. Please visit our audition hub for readings and song samples. The material does not have to be memorized, but if it is memorized your child will find it easier to perform. We also suggest that your child review the list of skill requirements so that he/she understands the audition expectations and feels familiar with what will take place. What if my child doesn't want to sing? The singing station is setup to be welcoming, supportive and free of stress. We always encourage performers to give it a try, but if they are reluctant, their speaking talents can still find a strong home in Company where players always sing together. Will my performer(s) have to act/sing by him/herself at any time during the audition? Yes. At the Audition Station your performer will perform a brief reading and sing a short song excerpt. The audition takes place in front of two of our theater directors who will side coach and guide your performer through the process. It is our aim to make these auditions stress-free and fun! We understand that this may be the first time your young performer experiences an audition, and so it is just as much about learning how to audition. Performers can feel free to dress up or wear casual attire. Whatever makes them feel most comfortable. If my child is accepted into a Company or Broadway level, what does that entail? Company and Broadway Level I will meet for a 2-hour class once a week. There are no extra requirements, although performers in this level are strongly encouraged to take a technique class (Acting Technique, Voice or Theatrical Dance). 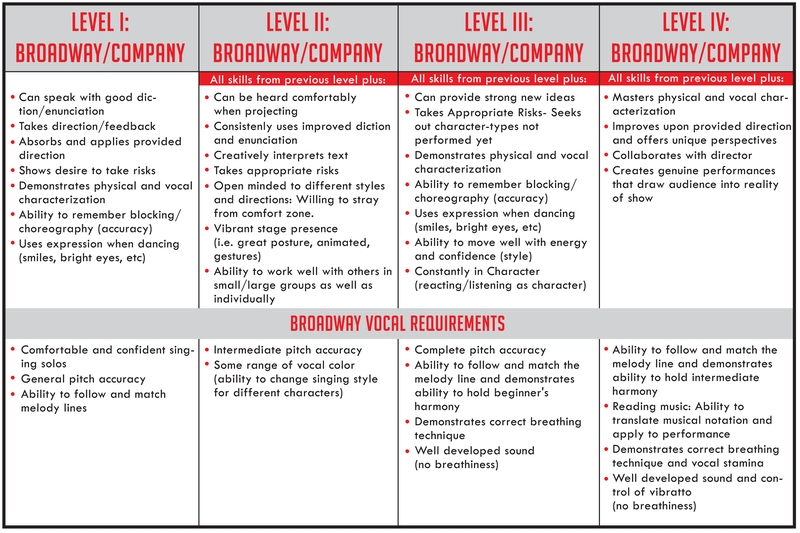 Performers in Company and Broadway Levels II - IV will meet for a 2-hour class once a week and are required to take at least one technique class (Acting Technique, Voice or Theatrical Dance). The more technique they study, the more advanced they become. Can my child register in more than one class? Yes! None of our classes have their show dress rehearsals or performances at the same time. We offer elective pricing, to encourage performers to develop all their performing arts talents. Can my child elect to join a recreational program or a lower level program than what they are invited for? If that works better for your family, absolutely. An invitation to a specific level automatically means they can choose to do any other lower level program. What if my child is already registered for a class? Class switches and additions are easily made from the time your actor receives his/her audition feedback until February 1st if space is available.